Unless ACI have inside information Ford hasn't published, that isn't true (yet). 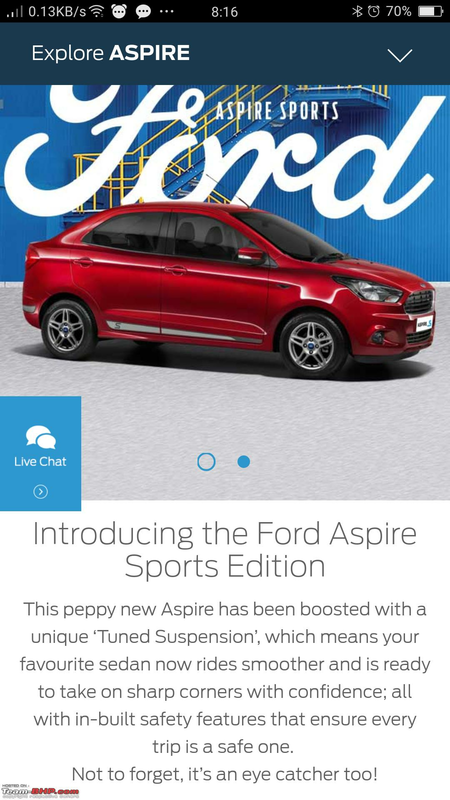 The official website clearly says Sports variants for Figo and Aspire are available in Titanium MT guise only, though I did notice the in-cabin pictures have an 'Airbag' tag on the passenger seat. Always thought it was just a bad Photoshop job but a possible option coming up? The Ford Figo Sports could be had with the option of side airbags at an additional cost as per ACI article below if that is true it is fantastic news for people wanting for additional security. Can you please quote the relevant section? From what I glanced thru, I did not see anything on side airbags. That is really weird I read that on the first page can't find it anymore not sure if ACI have edited the article. It had clearly mentioned that there was an option for side airbags with additional cost otherwise I would not have posted it here. Mods please free to delete my posts if it is necessary. The website has been updated. There is no Titanium option pack with 6 airbags for the Figo/Aspire sports edition. 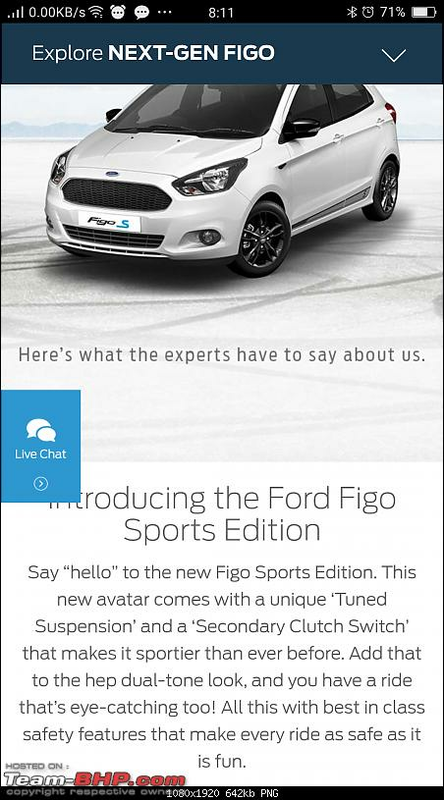 There was a typo on the Ford website which was later corrected. ACI by then had already published the review. The typo was pointed out by Team-BHP members and when I went for the event, I pointed it out to Ford. They got it corrected immediately. 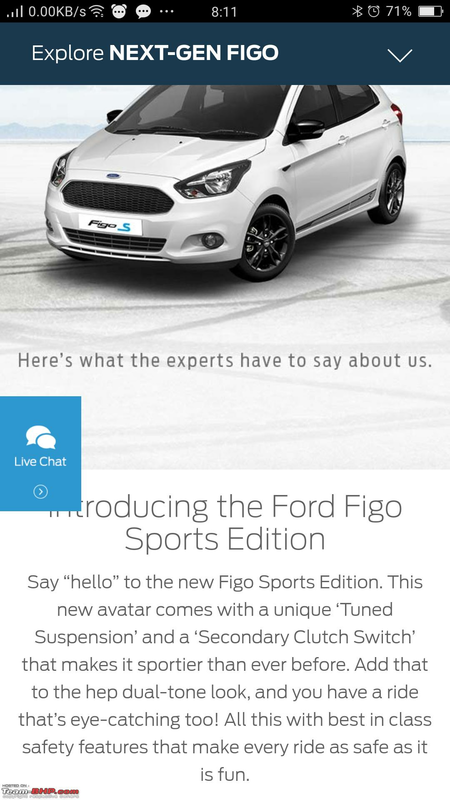 I went through the article and there is no mention of side airbags at additional cost for Figo Sports edition. Edit: Just saw the posts, it has been already clarified. Thanks. Last edited by PraNeel : 29th June 2017 at 13:17. The Volkswagen Polo GT TDI for a long time was the only performance-oriented hatch with a diesel engine on offer. Now, however, it faces some stiff competition from another diesel-warm hatch, the Ford Figo Sports Edition. Both make an almost similar amount of power, come with only manual gearboxes and promise to be frugal and fun. We put the two through their paces to see which one makes the bigger impression. The Figo S really shines when you step up the pace. It feels extremely secure and comfortable at speed, the sharper responses make it a thrill to drive and Ford has improved front grip so much, it turns into corners very nicely and feels planted. Last edited by jetti : 29th June 2017 at 15:06. My Figo Sports in ingot silver has arrived. I would be taking delivery of the car by sunday. I will post an ownership review after getting hands on my new car. Congrats! Could you post more pics of this silver beauty? I want to see how it looks from other angles - like esp. side view and rear three quarters. Last edited by greenhorn : 17th July 2017 at 17:27. I had the exact same questions and hence I had tried calling up the Ford Authorized Spare Parts store here in Bangalore. But there was no answer. I got their email off the website and have sent them a request. Let's see if they even respond. If they do, I will surely share the info here! I wouldn't say 'differently tuned' suspension. As mentioned in the review on this thread, it was shortened to keep the ground clearance in check due to the bigger wheels. I haven't driven the non-Sports version much , so I can't comment on the actual difference. 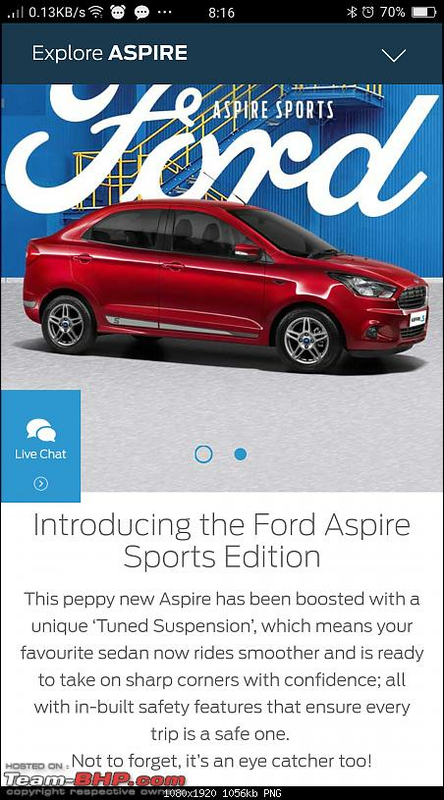 However, I have driven almost 3k kms on my Aspire sports in varying road conditions, with the car fully loaded and not and I can say, apart from the car tracking well, there is not much 'sporty' feel when it comes to the stability at high speeds. It is no where in the league of the previous gen Ford's, especially the Figo. I had to slow down on curves on highways which I used to take without lifting off on my old Figo , on the Aspire. On a straightline, the pull drift steering gets annoying and on expansion joints which are a bit more protruding than usual, the rear gets bouncy. Keep it at sane speeds, and it is comfortable and it gives a big car feel. I can't imagine this car with 175 size tyres, it actually needs the bigger wheels that comes on the Sports. Stupid question, but the ford website does not mention anything along the lines of any suspension tweaks on the website. It does, right in the introduction itself. Last edited by CrAzY dRiVeR : 18th July 2017 at 08:17. I understand that the Figo S will have a production run of 1000 units for the Figo and Aspire. Hi AMG Power - Do you mind sharing the source of this info? Done with the first check up at 2800 kms. Nothing much apart from wash and I requested for an oil change which they did happily. Metro Ford Lingrajapuram is open on Sundays now due to higher inflow of cars. They take limited number of cars for service on Sundays due to limited staffing. The place is filled now and is beginning to remind me of a Maruti service center. Surprisingly, the place was filled with Ecosports,Endavours, old Fiesta and Figo's and a couple of Ikons. Mine was the only new gen Figo. The SA who I know from my Figo days was surprised to see the bigger wheels on an Asipre. He was aware of the different shocks, but not the bigger wheels. I am based in Pune and considering the Ford Figo Sports (Diesel) model. 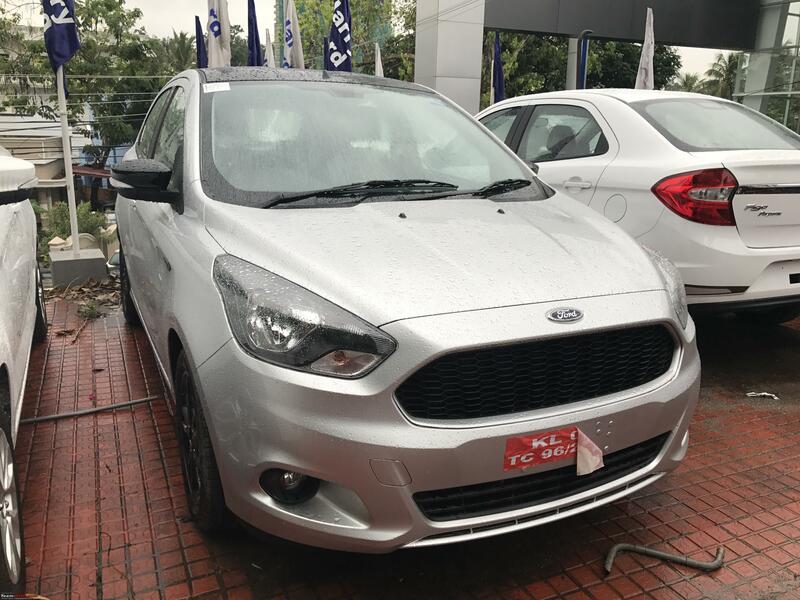 There are 3 Ford dealerships in Pune currently. One dealer is offering 30,000/- cash discount and committed that they will match the Zero Dep insurance quote that i will get from outside. Is this is good deal? or shall i go for more, for example, ask for parking camera and sensors free of cost in the deal?